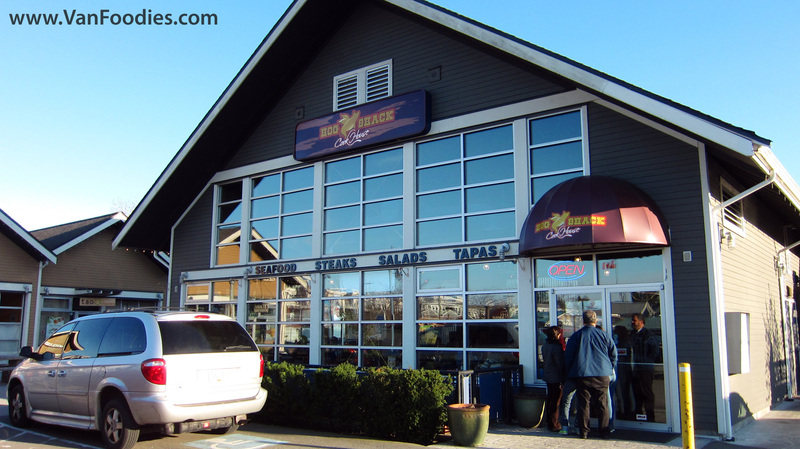 June 20, 2012 by Mr.
On a sunny day in spring, we visited Hog Shack — a BBQ joint in Steveston. There was no way we could’ve prepared ourselves on what was to come: more food than two human beings should ever eat in one sitting. The inside of Hog Shack was just as you’d expect for a place like this: red and white checkered table cloth, wood paneled walls, and a lingering smell of charred meat and grease. I liked where this was going. See we had purchased a $39 deal that included the $50 Johnny’s Jurassic Platter, and 2 beers. The platter started us off with a salad each, and followed up with a huge plate piled with various meats, and dessert. 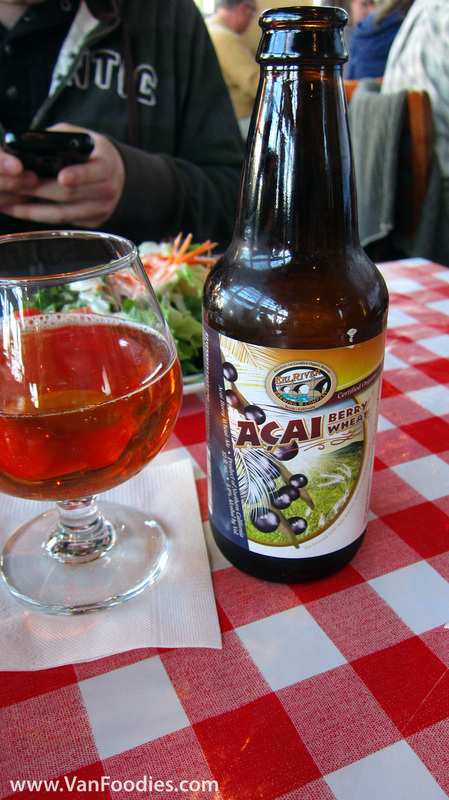 I ordered an Acai Berry Wheat Beer. I don’t typically order fruity beers, but this was a nice surprise. The light citrus taste and slight wheat taste bounced and mixed in my month, making it a great easy drinking summer brew. The quantity of meat in this package exceeded awesome and border-lined on insane. There was two whole chicken legs, beef and pork ribs, a little pile of pulled pork, fries, corn bread, beans, and coleslaw. In addition, the starter salad was drenched in dressing, plus a fair chunk of dessert. The quality however left much to be desired. The pulled pork was excellent — moist, tangy, and rich. The problem is, that was the highlight of the entire meal. The chicken legs and thighs had a heavy smokey flavour. They were well seasoned and fairly tender, but the skin was leathery, very difficult to chew, and tasted rather strangely. The beef ribs were badly charred on the outside, the meat wasn’t tender and was a little dry. The pork ribs were better but I’ve certainly had better. The fries had a nice seasoning on them, but weren’t at all crispy. The coleslaw was too hard, had too much sauce, and was too smokey (heavy burnt taste). The corn bread and the beans were good, but they would hardly make up for the other misses they’ve made on this platter. By the time dessert came, we were quite full, so I’m not sure if my judgment of the Ek Mek was entirely fair. Needless to say I didn’t like it all that much. $39 was still a good deal considering the amount of food we got, not so much at the regular price. Exactly as you’d expect, quick and efficient. The food at this place didn’t impress me a whole lot. 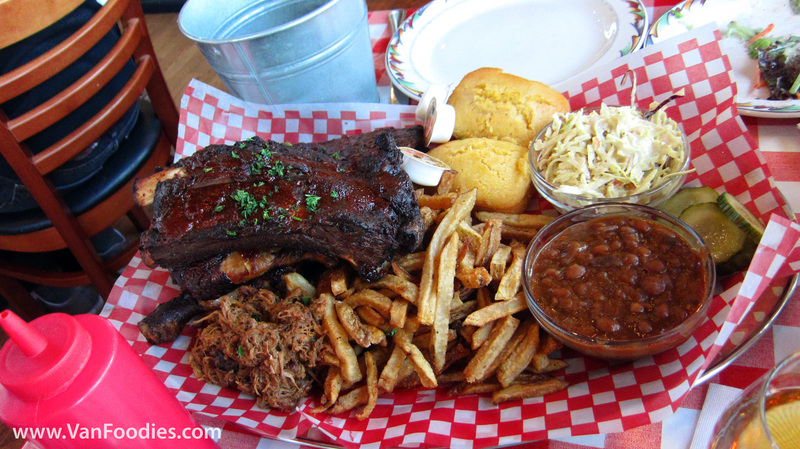 One can’t help but compare it to Memphis Blues, and to me, Hog Shack falls far behind. I honestly can’t say I would like to visit here again, at least not for BBQ meats.